Writing is an arduous task that is mentally demanding. If you are working on a dissertation, a thesis, a research proposal, journal article, or grant proposal then chances you have already experienced some of those detestable moments when you don't like to write.Whether they are 'motivational roadblocks, writing blocks, or circumstantial inhibitions', you should always, as Stephen King contended, come to writing anyway but lightly. Part of this preparation is to spend sometime reading writing guides. Yes there are plenty out there but some really stand out from the rest. The title we have for you today is one such example and though it is academically focused but its insights can be extrapolated to any other writing genre. 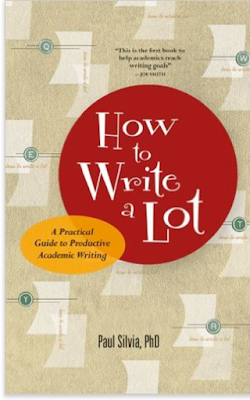 "Writing productively is about actions that you aren't doing but could easily do: making a schedule, setting clear goals, keeping track of your work, rewarding yourself, and building good habits. Productive writers don't have special gifts or special traits, they just spend more time writing and use this time more efficiently. Changing your behaviour won't necessarily making writing fun, but it will make writing easier and less oppressive."